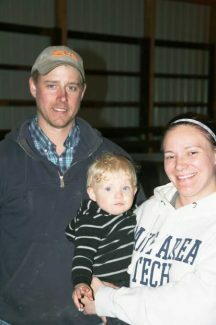 Brandon and Laurie Johnson with son Kolt, South Shore, S.D., purchased Kopriva Angus Ranch bulls. 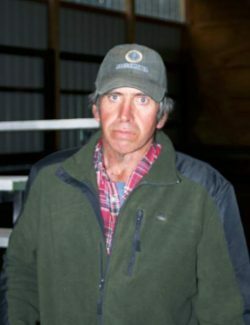 Russ Cole, Hitchcock, S.D., purchased several Kopriva Angus Ranch bulls. Location: held at the ranch, Raymond, S.D. 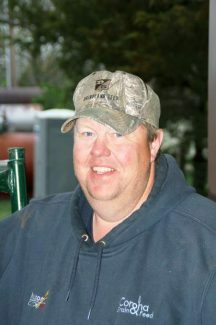 The Kopriva Family held their annual bull sale at their ranch just outside Raymond, S.D., on May 7. This was an evening sale and there was a bit of a chill in the air, but that didn't hamper the good crowd that gathered to inspect and buy this high quality performance set of bulls. The Kopriva family has really put a lot of effort into improving their cowherd over the past few years by utilizing to top AI sires available in the Angus breed and utilizing an embryo transfer program with some of their elite females. These bulls were a real performance set and along with the top blood lines the Kopriva's furnished; as complete a set of performance records as it is possible to collect. They have strived for balance trait Angus, moderate in size, strong on fertility, and low labor cattle that consistently turn a profit. Special effort is to produce cattle that have a strong maternal trait, especially sound udders. The high selling bull on the day was lot 404, KA Windy Mario 404, an Apr. 2014 son of Mogck Whispering Wind 584 that has epds of CED 3 BW 3.3 WW 53 YW 100 Milk 26 $B 99.99. Rickie, Randy and Elwood Peterson, Willow Lake, SD were the buyers at $5,000. Also selling at $5,000 was lot 498, KA Timeless Gamer 498, an Apr. 2014 son of WMR Timeless 458 with epds of CED 4 BW 5.0 WW 60 YW 108 Milk 25 $B 98.57. This bull sold to Thompson Angus, Kintyre, N.D.
Todd Whempner, Wilmot, S.D., purchased several bulls including lots 4206 at $4,900 and 425 for $4,800. KA Expedia Summit 4206 is an Apr. 2014 son of S Summit 1147 with epds of CED 17 BW -3.0 WW 41 YW 70 Milk 32 and KA Eldon Summit 425 is a Mar. 2014 son of S Summit 956 with epds of CED 15 BW -1.8 WW 49 YW 86 Milk 29. Lot 479, KA Eisar Pioneer 479 is an Apr. 2014 son of SAV Pioneer 7301 with epds of CED 1 BW 3.1 WW 44 YW 80 Milk 25 that sold to Jerald and Barb Braun, Westport, S.D. Lot 4285, KA Right Summit 4285, a Mar. 2014 son of S Summit 956 with epds of CED 11 BW .3 WW 54 YW 98 Milk 32 sold to Gordon Swanson, Bristow, Neb.